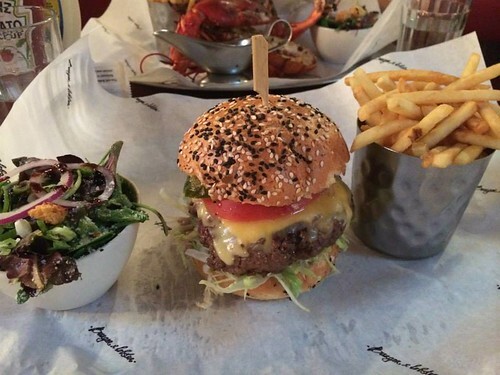 Yes, this restaurant is called “Burger and Lobster”. Why? Because they only have three menu items – Lobster, Lobster roll, and Burger! I love the simple menu. I loved it so much I went here twice during my time in London (well, partly because it was so close to my hotel!). The first time I had the burger, which was alright (The one in Sydney still is king) but man, the second time I went I had the steamed lobster AND IT WAS SO GOOD. 15 minutes of silence as I tore that lobster apart (not a really good sight so I wouldn’t bring a date here haha). This picture is the burger that I had the first time I visited this restaurant. It looks good, but it was really big and the patty wasn’t as juicy as I hoped it to be. Definitely get the lobster first if you come here. I really like restaurants with small simple menus, because I don’t have to get a headache trying to think what I want. If you ever been to a chinese restaurant you know there are a bizillion dishes you can order from. Just trying to think what I want to order makes me full already. 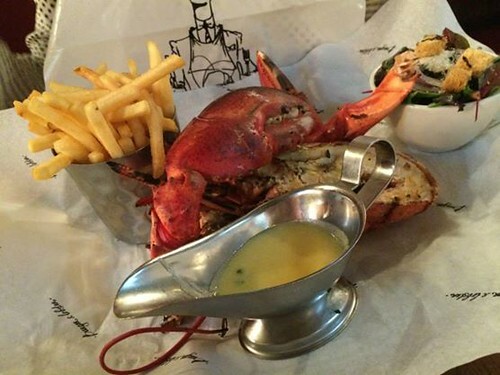 Cheers to Burger and Lobster! me want too..the lobster was SO GOOD!